Sometimes your dog’s wardrobe needs an update. 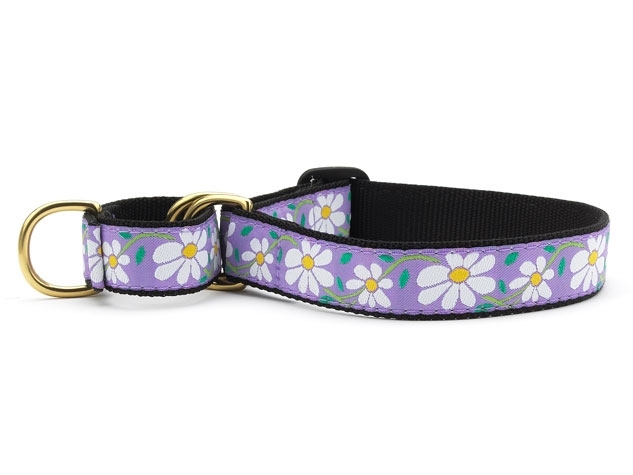 Made from custom-designed ribbon hand-sewn onto high-tensile nylon, this martingale collar features cheerful white daisies against a lavender background. The delightfully colored ribbons are stain and fray resistant and carefully designed to last a lifetime. The martingale collar can be used as a gentle training collar. Sometimes known as a no-slip collar, martingale collars are perfect for dogs that pull or easily slip out of their collars. The martingale dog collar makes a perfect choice for your loved dog. Up Country Martingale Collars are a gentle way to have control over your dog. Martingales create an even tension around your dog's neck avoiding neck and throat injuries and does not hurt or pinch your dog. They should be fitted so the collar fits the dog's neck when the small loop is closed. Made of high tensile nylon with a fray and stain resistant ribbon sewn onto the nylon makes the collar strong. Easily adjusted for the perfect fit. Machine washable, drip dry. Sizing for Martingale Collars is S Narrow 12 - 17.5," M Wide 12.5 - 20," L 13.5 - 22.5," XL 12 - 25." Please note: Martingale collars should never be left on dogs without supervision.